This extensive study focuses on Homer's early work that he produced in the towns and villages in the Hudson River Valley of New York. What sparked the interest of the author in pursuing this study was to find the reason why Homer had changed the background of his oil painting Snap the Whip (Metropolitan Museum of Art) replacing it with a view of an open landscape with a few buildings seen in the distance. 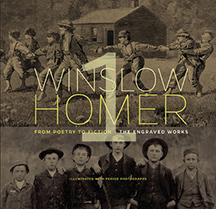 The book celebrates the iconic early paintings and wood engravings by Winslow Homer. Discussed in detail are his school series paintings and engravings including Snap the Whip, The Country School, The Noon Recess, and The Morning Bell, as well has his beloved masterpieces of rural America's youth, including Taking Sunflower to Teacher, and Crossing the Pasture. Two chapters in the book, The Disappearing One-Room Schoolhouse and Eyewitness to History, include never before reproduced or published photographs related to Homer and his subjects. Winslow Homer - From Poetry to Fiction is also available as a hardcover exhibition catalogue with an illustrated checklist of 240 prints and a Postscript that appears in both books. Hardcover first edition w/French-fold dust cover; signed by the author. Large 12 x 12 in. format, 416 pages, 8 Chapters, 485 illustrations inclusive of paintings, watercolors, drawings, prints and photographs. Published in conjunction with an exhibition held at The Butler Institute of American Art, Youngstown, OH, January 22 to March 19, 2017.
color reproductions of paintings, watercolors, prints and drawings; 8 chapters with scholarly essays; 480 color and black and white illustrations with an interpretive, fully illustrated checklist and notes. "Returning home from a lecture trip to the University of Connecticut to find your fabulous book waiting. WOW! It's gorgeous, and so full of fascinating new information. The period photographs alone are uncannily apt as points of comparison, and the other visual material, such as the fashion images, are so effective too for building context. From what I've read and looked at so far, I'm struck by your close readings and knowledgeable discussions/interpretations. And the reproductions of Homer's works are stunning!" 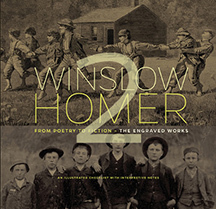 “I am immensely impressed with the content and reach of this book: Winslow Homer From Poetry to Fiction—The Engraved Works. "Winslow Homer, From Poetry to Fiction – The Engraved Works (2017) by Reilly Rhodes is an exquisitely crafted book of art reflecting the vast knowledge and passionate research interest of a genuine connoisseur. Devoted to the analysis and interpretation of the monochromatic graphic work of America’s most beloved artist of the nineteenth century, the book does not only regale the experts in the field, but also pleases the bewildered eyes of all those who find art a veritable pleasure and inspiration. The eight comprehensive chapters include no less than 485 illustrations consisting of reproductions of wood engravings created for publication in the pictorial press, watercolors, paintings, historical photographs and works by other artists of the time. Beginning his extensive research in the mid 1990s, Reilly Rhodes spared no efforts to demonstrate that Winslow Homer (1836-1910) lived for his art and could be rightfully considered the greatest American artist of the nineteenth century. The book is by no means dogmatic; on the contrary, the author’s tone is persuasive and thought-provoking. With a reader-friendly approach and wonderful explanations about both Homer’s life and work, Reilly Rhodes rises up to the challenge of making art accessible to the general public. The author’s greatest merit is to have examined an often overlooked and underrated body of work from the artist’s early career. Another element of originality is the inclusion of tintypes which have never been exhibited or published before, but resemble Homer’s subjects and models in his engravings between 1857 and 1875. The book is not only about Winslow Homer; it is about an entire historical epoch and the artistic representation of the emergence of America’s own national identity. Accompanied by an exhibition of the same title, it focuses on Homer’s transition from popular illustrator to fine artist. His wood engravings express a large variety of thematic areas covering different social, cultural or political aspects of nineteenth century America. Reilly Rhodes identifies 13 such thematic areas: The Apprentice Years; Early Portrait Work; Leisure Time Pursuits; Rural America; The War Years; Holidays; The Sporting Life; Courtship and Romance; Seaside Views; America’s Youth; The Changing Role of Women; Urbanization and Society; Poetry and Literature. Although influenced by the Hudson River school which celebrated pastoral landscape painting, Homer preserved its unique style and strived to produce art which would be imaginative, aesthetic and intellectual in its content. Winslow Homer’s wood engravings represent invaluable historical resources. Reading the book, I had the amazing chance of discovering an extraordinary artist. More than that, Reilly Rhodes painted in words an incredible fresco of the transformative years of American society brilliantly depicted by Winslow Homer in his engravings. In the chapter The American Scene, the author describes Homer’s struggle to portray the virtues of the American people and the ordinary realities of everyday life. After a time of artistic experimentation, the late 1870s and 1880s find Homer inspired by the Barbizon school whose artists sought to paint directly from nature and recognized the value of working plein air. The chapter Winslow Homer: Imagination and Innovation relies on the reasons behind his popularity and the all-encompassing nature of his engravings. One of the things I appreciated most was Reilly Rhodes’s keen eye for details and the impartiality of his comments. For example, in the chapter Fashion, Style and Indulgence, he notices the artist’s penchant for recording the events associated with the members of the upper and middle classes (see March Winds, 1859; April Showers, 1859; The Morning Walk – The Young Ladies’ School Promenading the Avenue, 1868 or On the Bluff at Long Branch, at the Bathing Hour, 1870). However, he also mentions Homer’s engravings Watching the Crown (1868) and Snap the Whip (1872) which show children with patched and threadbare clothing indicating that not everyone belonged to the rich and affluent segment of society. The chapter Civil War – The Embedded Artist draws on Homer’s experience as a commissioned artist by Harper’s Weekly. His early war subjects centered mainly on camp-life activity and even his later depiction of war scenes was heroic and idealized in Napoleonic style. I prefer the more solemn engravings Home from the War (1862) showing Civil War veterans returning to their families and The Veteran in the New Field (1865) illustrating a Union soldier reaping the wheat with a scythe and evoking the Grim Reaper and the image of Kronos, the ancient Greek god of harvest associated with the destructive passage of time. In the chapter Beginning of a New Era, the author praises Homer for perfecting his style, probably due to his French experience. Among his earliest paintings I particularly like The Bridle Path, White Mountains (1868) and White Mountain Wagon (1868-69). 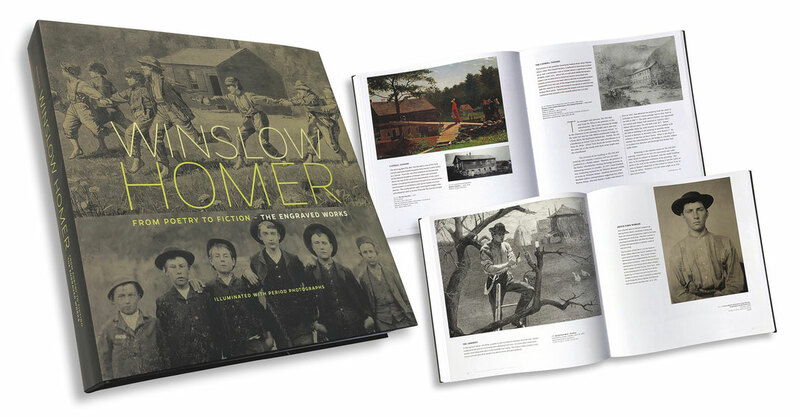 The last two chapters, The Disappearing One-Room Schoolhouse and Postscript Dutch Immigrant Discovery in Winslow Homer Engraving, tackle in detail some of the most famous and interesting wood engravings and paintings signed by Winslow Homer. Although Snap the Whip (1872) is the best-known, my favorite are The Noon Recess (1873) and Taking Sunflower to Teacher (1875). The former shows a meditative teacher looking out the window and a boy reading in the classroom rather than playing with his peers outside. The latter portrays a young black boy wearing tattered clothing and holding a single sunflower to bring to his teacher. The watercolor is exceptional because of its symbolic meaning since the boy represents the new generation. Other engravings I loved were Our Watering Places – The Empty Sleeve at Newport (1865) and Cutting a Figure (1871). They both allude to the changing role of women in the Post Civil War period. Finally, Homer’s last wood engraving, The Family Record (1875) hints at multiculturalism, America’s greatest asset. For all of his popularity and extraordinary ability, America’s most beloved artist of the nineteenth century left few clues about his life and his work. There have been scarcely any attempts to create a ‘journal of life’ when it comes to Winslow Homer. One of the difficulties for those who would write about him is that he closely guarded his privacy and never granted an interview to anyone. Not even the few letters that have survived, written to family members, provide any insight into his thoughts when it came to personal matters. There has never been a successful biography written about him. Surprisingly, historians know more about the life and works of Michelangelo, Leonardo da Vinci and Titian than they do of Homer. The absence of information does not only apply to Homer’s biography, but many of his works of art are also not well explained—some were left untitled, undated or without identity of any sort. Winslow Homer From Poetry to Fiction - The Engraved Works is a bold approach to piece together some of the missing information about Homer and his art. It is not an attempt to serve as a biography, but instead places special emphasis upon certain aspects of the artist’s life and work that previous writers have failed to consider. While it does not explain all of his art, it does illuminate many uncharted areas of Homer’s life and inspires deeper thought about his art, leading to a new understanding and appreciation of the work of one of America’s greatest artists. In many cases, it corrects the record where correction is needed. It also draws the reader in from the very beginning with remarkable images like the tintype of six boys on the book jacket. They closely mirror the youths engaged in the schoolyard game that Homer depicted in the wood engraving “Snap-the-Whip” and the two paintings that he made of the same subject. The discovery of the image of the country schoolboys is astounding because it falls outside of what people considered possible. It is a prelude of what the entire book is about: breaking new ground when it comes to Winslow Homer. Never before has Winslow Homer’s story been told with such drama, clarity and accuracy. Though Homer’s personal story may lack a dramatic narrative, there are clues to understand his life and art. When it comes to Homer’s early wood engravings, his subjects need to be understood in terms of what he observed and the way he saw the world. The majority of his wood engravings were produced when he was still a young man in his twenties and early thirties. Homer had a natural talent that most agree showed strong conviction of character. Not only could he observe events, he sought to animate the liveliness of the action taking place. No other artist in his time demonstrated as much skill. He seemed to know by instinct what made a scene come to life. For nearly eighteen years, Homer worked each day at drawing his subjects in monochromatic tones. It was not until the early and mid-1860s that he began working with color pigments with any regularity. His first serious paintings are of Civil War subjects and soon to follow was his croquet series. also revealed with equal intrigue. Homer’s 1869 wood engraving, The Playmates, is the frontispiece in the book. The image was made for John Greenleaf Whittier’s poem “My Playmate” and serves to expose one of the chief aims of the book, that Homer also illustrated music sheet covers [ballads] and poetry. Homer was not just an illustrator for the pictorial press. He was equally active in making wood engravings for leading poets of the day, including William Cullen Bryant, James Russell Lowell, Henry Wadsworth Longfellow and Alfred Lord Tennyson. Each chapter or section of the book begins with an introductory statement telling the reader what to expect. The first statement begins with the admission that there have been many books and exhibitions based on the subjects of Winslow Homer, and concluding that this one is different. Its purpose and aspiration is clearly stated: “to examine and interpret the illustrations and to breathe life into the works for a deeper understanding and appreciation.” It achieves precisely that and much more. The book provides the reader with a unique experience as they begin to read the unfolding story of Winslow Homer’s chronicle of daily activity as the words and illustrations bring it to life. The story is focused on the first one-third of Homer’s artistic career, from 1856 to 1875, and examines his transition from illustrator for the pictorial press to fine artist as a painter. The chapters are beautifully illustrated with images of wood engravings, period costumes, drawings, oil paintings and watercolors from American museum collections. Also included are unique period photographs, mostly tintypes and prints from glass negatives, many of which have never before been published or exhibited. Some engraved works by Homer are juxtaposed with images by other artists as well as period photographs. Some portions of the book examine nineteenth century society, fashion, literature, farm life and war. There are definitely some unique features in this story that are unlike most museum structured fine art books. The story begins with a look at life in New England, mostly in Boston and Cambridge, as well as the rural countryside, and provides a base of how daily life was for the common man in the 1850s. Many of the illustrated works include activities such as family and holiday celebrations, academic life at Harvard College, winter scenes of people ice skating and sleighing, social events, and activities on Boston Common. During the war years, Harper’s Weekly engaged the then twenty-five-year-old artist to make illustrations that provided a glimpse of ‘behind the scenes’ activities of the men in camp and in bivouac. In some cases, Homer also illustrated activities closer to home, such as assembly meetings at Union Square in New York, assembly gatherings in public halls, as well as benefit events in Manhattan and Brooklyn that showed support for the men in the military. Homer made sketches of parades, soldiers on leave for brief home visits and volunteer-sponsored events on the home front. All of the illustrations are richly detailed with information to make the scenes more enjoyable to appreciate and understand. One large illustration centers on fashions of the day, juxtaposed with beautiful color photographs of costumes from the collections of the Museum of Fine Arts, Boston, Kent State University Museum and The Metropolitan Museum of Art. The illustration tells of a little known historic event long forgotten in today’s school lessons. The Great Russian Ball at the Academy of Music, November 5, 1863, tells of a time during the Civil War when the Emperor Napoleon of France wanted the United Kingdom of Great Britain to join French forces in support of the Confederacy and to recognize the Confederacy as a sovereign nation independent of the northern states in America. When Russian Tsar Alexander learned of Napoleon’s plan, he immediately sent the Russian Imperial fleet to New York and San Francisco as a show of force in support of the Union. The Tsar ordered his admirals that if they found themselves in conflict with their common enemy, they should defend the Union and place themselves under the command of President Lincoln. Throughout the book, there are several isolated stories that relate to Homer’s engravings and the events and conditions of a time when America was experiencing great change socially as well as economically. The book stays faithful to the content in the touring exhibition that began to travel nationwide following an inaugural opening at The Butler Institute of American Art in January 2017. The subthemes in the book conform to the substance of content in the exhibition. These includes Homer’s early works as an apprentice in Boston, his 1850s engravings for the pictorial press, the Civil War, his search for subject matter based on the American experience, and his early development in forging a national art genre for America. The art of Winslow Homer first began to show dramatic change following his travel abroad to attend the 1867 Universal Exposition in Paris. The book does not dwell so much on the changes seen in his pallet as it does on his choice and search for new subject matter. There is an important discussion on the reason for this change that stems from the post-Civil War era to the search for a new genre that identifies with America’s future. Children become the primary source of his inspiration, but not exclusively. Homer continued making images of young women of his own age, but they were much different than the way he delineated their presence in earlier works. Gone are the images that were intended to be primarily visual in creating scenes or describing an event. He was now creating works of art that are to be appreciated primarily, or solely, for their imaginative, aesthetic, or intellectual content. During this time, Homer committed to making subtle but important compositional adjustments. He was now in his mid-thirties, perhaps thinking of a future without ties to the pictorial press. Homer began to focus on more inspirational work and we see for the first time a hint of the painter to come. Homer also began to concentrate on making works as part of a series. He completed a final painting in his croquet series and began to focus on schoolhouse subjects, farming activity, children’s games, storied adventures, and leisure time pursuits including day trips to the White Mountains of New Hampshire and Gloucester Harbor. Every page and paragraph of the book is filled with information, details and new findings, making the reader feel a part of the search for answers to unresolved issues. This is where the cover of the book comes to life and where answers to so many questions are found. There are several pleasant surprises in the book right up to the very last pages. The author includes a bonus with the Postscript that supports and reveals new information never before realized in the documentation of Homer’s final wood engraving for the pictorial press in 1875. The identity of the subject and the close relationship of the Hurley town’s people to the one-room schoolhouse depicted in Homer’s iconic paintings Snap the Whip and wood engraving “Snap-the-Whip” are revealed. The last chapter, “Eyewitness to History,” utilizes an unusual component when discussing or surveying the works of Winslow Homer. The method involves the use of photography in the time of the artist. The chapter juxtaposes tintype photo images with Homer’s engravings for the purpose of making comparisons and draws attention to the photographed subjects in the rural areas of Ulster County, New York, where Homer visited and worked much of his time between 1869 and 1877. The book then concludes with an extensive illustrated checklist with didactic interpretations of two hundred and thirty wood engravings and music sheet covers that date from 1856 to 1875. For anyone who loves the work of Winslow Homer, this is a must-read that will take you on a journey like no other book that has previously touched on the subject. It is simply the most valuable and informative reference tool to Homer’s wood engravings and perhaps, more importantly, ties two art forms together—engraved illustrations and painting—in a way that explains how one supported the other and how both contributed to Homer’s success as a painter. Traveling Exhibition Development and Management, New York, NY.